World Championship Soccer 2’s development process was conducted by one of the era’s most successful British software houses, one that had firmly demonstrated its capabilities in producing pixel-perfect football titles, quite literally from the top-down. The ‘Mystery Chefs’ were none-other than Jon Hare and Chris Yates. The developer – Sensible Software. MegaBites: How was it that Sensible came to be involved in the project and why all the secrecy? Stoo Cambridge (Software Artist – Sensible Software): I can’t quite recall the exact day, or even the week that I was approached to work on the project. What I do remember is my sheer delight in the knowledge that I would be working on the Mega Drive. As for how Sensible Software became involved, I don’t quite know how it happened. I think I was working on Sensible World of Soccer and possibly Sensible Golf at the time. I suspect it was Chris Yates’ doing. As the co-owner of Sensible Software and its lead coder, he was quite friendly with Sega during this period. Wallace Poulter (Producer – Sensible Software): I had joined Sensible Software at the end of December 1993 and World Championship Soccer 2 was one of the first titles I took on. The game came out prior to the 1994 World Cup, which was between 17th June – 17th July that year. I suspect that the game’s release would have been in April, or May of that year at the latest. SC: As for the secrecy surrounding Sensible Software’s involvement, at the time I didn’t even know the game’s name when I was working on it! All I knew was that we were making a game for Sega, to be used in their new sports range. Quite exciting, but totally hush, hush. One can surmise that all this secrecy may have been for contractual reasons. My view is that the success we had had with Sensible Soccer may have, in Sega’s opinion, detracted from the Sega Sports branding. 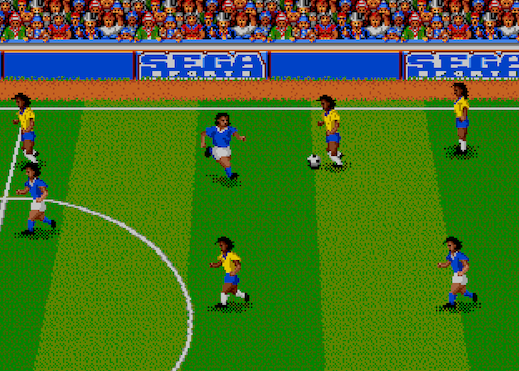 Released in standard European blue-box format, and in the Mega Drive Classic range, World Championship Soccer 2 was also released on the Sega Genesis in the US. Although the ‘brown’ and ‘red’ versions are still fairly common, the blue-box version – believed to have only been released in Hungary – is absolute gold dust, as Stewart Greenwood’s eBay bid confirms. Search your collections now! SC: I find it quite unbelievable that the blue-box edition is worth so much money. How I wish I’d bagged a copy back then! Imagine what it would be worth if it was signed! MB: I daren’t imagine! So, let’s take it back to the game’s development. Despite Sega’s shroud of secrecy, what can you share about your role during World Championship Soccer 2’s development, Stoo? SC: I was responsible for creating all the in-game art and menu graphics. This involved working with Chris Yates to create a unique side-scrolling effect that was used on the pitch. On reflection, this worked exceptionally well – Chris certainly knew how to do some proper old-school hardware coding! When it came to the sprites, I was a little frustrated as I had to keep the same number of frames as used in Sensible Soccer. MB: Was that the only element that World Championship Soccer 2 shared in common with Sensible’s legendary football title? SC: Far from it! Where can I start… I can reveal that the whole Sensible Soccer game engine was used in World Championship Soccer 2. Of course, this doesn’t mean it was Sensible Soccer through-and-through, clearly not, but the raw mechanics of the game’s Amiga engine were used and adapted to work on the Mega Drive. 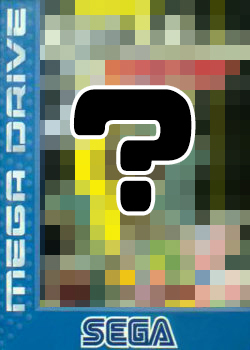 MB: I assume that the Mega Drive’s compatibility with Amiga ports was a huge benefit to you? SC: Precisely. The Mega drive shared the same CPU as the Amiga, which really opened up the doors for a port of the code. Other than the CPU element, there were overlaps, in terms of what was native to the Mega Drive and what was ported from the Amiga code. This was simply a strategy to reduce development time. One of the immediate casualties of this was the sprites – the players had to use the same number of frames as those in the original Sensible Soccer. There were a few technical reasons as to why this had to be done. Although the size and aspect of the sprites were totally different to the original Amiga system, the way that the code functioned meant that everything associated with the sprites had to remain the same. 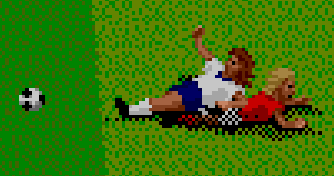 Despite World Championship Soccer 2’s significantly larger sprites, from an animation perspective, I was severely impeded. The sprites in Sensible Soccer were animated over five frames, with the middle frame doubling up as the frame required when the player was standing still. This worked fantastically great for small 12 pixel players, but when all of a sudden you’re using sprites that have far more detail and take up more screen space, five frames is not that great if you want smooth animation! 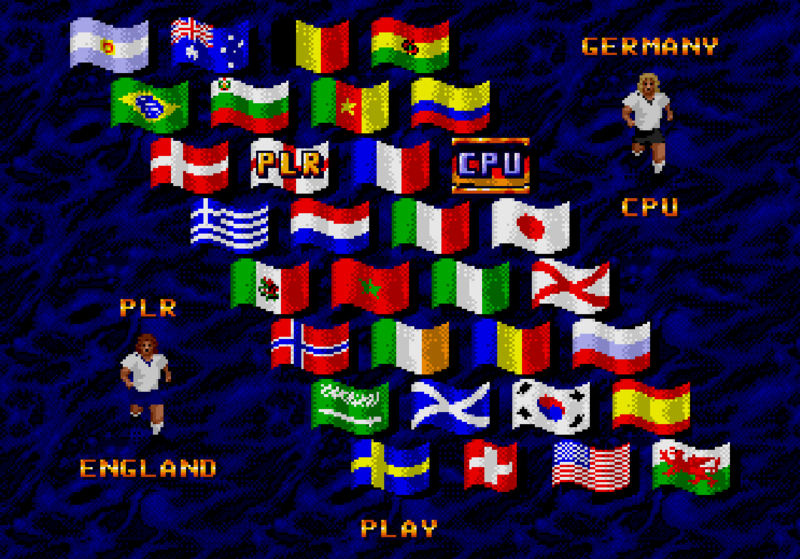 MB: Does any of your original World Championship Soccer 2 artwork survive to this day? MB: Fingers crossed! Although so much original work has been lost, what are your enduring memories of the project? WP: I remember calling Chris at some godforsaken hour, as FIFA had changed the number of points in the group stages from two, to three, right at the last minute. We really had to scramble to make the change. The entire development period was very short, maybe three months, four at the very most. There was no marketing or PR resources to speak of. Throughout, the head of Sega development in the US didn’t believe the project would be completed on time. But it was – just. SC: What sticks out for me was my work on the menu art. I was totally overjoyed with the icons and flags I’d drawn. Being able to work with the Mega Drive – which was a lovely piece of hardware – made it just that bit more easier to be creative. It ticked all the right boxes for me. I would have dearly loved to have done more titles on that console at the time. It was a great machine to work on, even though it only had a 512 colour palette! I still have the full development manuals for the Mega Drive somewhere – I was such a geek, even back then! 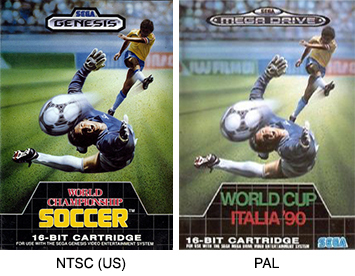 As you can see, what was known as World Cup Italia ’90 in the PAL release of the game, was entitled World Championship Soccer in the US Genesis release. World Championship Soccer 1 – 1990, World Championship Soccer 2 – 1994. It all makes perfect sense, right? SC: Having played the original World Championship Soccer, I wouldn’t say that this sequence of releases was intended as a natural progression. From my point of view the use of the World Championship Soccer name was purely a branding exercise for Sega, as Electronic Arts had demonstrated up to that point with the FIFA series. I suspect that this is what Sega was also striving to emulate. MB: And what exactly were you trying to emulate with World Championship Soccer 2’s abundance of mullets? SC: Ha ha! Well, I was, and still am, a huge fan of the British TV show Lovejoy, where Ian McShane played the role of a mullet-adorned antique dealer. 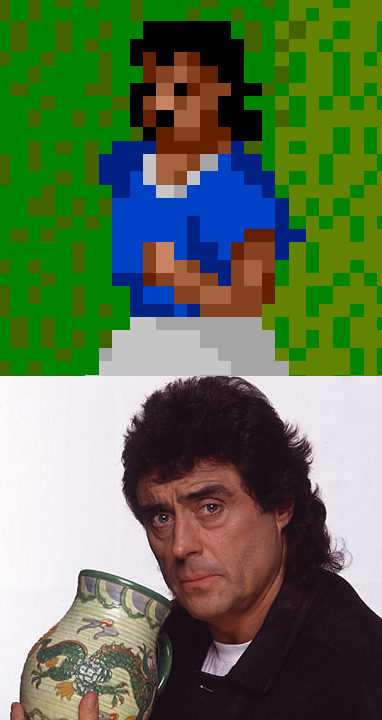 I was drawing the sprites for World Championship Soccer 2, when I doodled a Lovejoy mullet on a player for laugh. It didn’t look too bad and there were quite a few players with that hairstyle in those days, so I thought I’d leave it in! If someone at Sega had requested a less stylised hairdo I’d have given the players a short back and sides, but nobody said a word, so the mullets remained! Coincidentally, Lovejoy was also filmed in the town of Saffron Walden – the location of Sensible Software’s offices. I’m such a Lovejoy anorak! WP: Here’s another fun piece of trivia for you. As there was no official license for the game, we had to make up the names of the players. The England team is my old junior school team from Fens School in Hartlepool. Although it lacked the official World Cup licensing – a status that was grated to the ironically named British developer U.S. Gold – nothing detracts from the fact that World Championship Soccer 2 was a quality game and an extremely playable sports title that was the equal, if not better than its official counterpart. A true lost classic. You get some amazing interviews! I never knew of this game but now feel a desire to fire up the emulator and see how it compares to Sensi! I presume the lucky owner is NinjaBearHug on YouTube as he also is called Stu and has a full Pal collection? That’s him! But I don’t see any WCS2 clips on his channel. Then again, if I’d paid that money for a game I’d be afraid to open the box, let alone play it! At the time of WCSII was being developed i was working in SEGA Europe (spain) as Mega Drive (Games) brand manager. I recall perfectly that my SEGA Europe UK boss, named Tony Takoushi, tell me that this game was developed by the Sensible guys. At the time, sincerely, i don’t believed the guy, because the game was it’s very bad, and simple, but in the other hand was really in the same league of “Sensi”, fun but uncomplicated. Anyway, great find and amazing interview.